Home » star wars , the clone wars » Cad Bane: Best new Star Wars baddie in a LONG time! 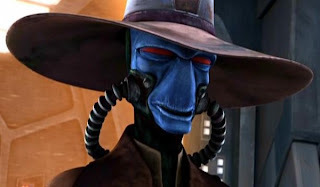 Cad Bane: Best new Star Wars baddie in a LONG time! Previously I'd noted that I've been late to the game so far as Cartoon Network's Star Wars: The Clone Wars animated series goes. I'm now regretting it even more, because today was the first time that I got to see Cad Bane in action. What else can I say? Cad is easily the awesomest new villainous addition to the Star Wars pantheon in too great a long while. Everything about Cad Bane screams bad-a$$: his Clint Eastwood/"spaghetti western"-esque look, his voice (provided by Corey Burton), his proficiency with the blaster (or more than one), his cold-blooded personality... and the fact that he's a reputation for being the most feared bounty hunter in the waning years of the Old Republic. That alone carries lots of street cred in the galaxy far, far away.